Spike and Romeo are two medium sized boys. These two boys are looking for a home together. YARN is assisting… All potential adopters are required to submit an adoption application and be approved. • If you have a cat, or bunny, he will be VERY interested and likely not leave that other pet alone. • Romeo is a good guard dog and will announce anything strange or moving. This can be an issue if you leave him in the backyard as he will likely find things to bark at. I’ve used a training collar in the summer when his hair is cut shorter and not so thick. Other than that, he’s a lovable dog that likes attention and snacks and needs his walks and exercise. • He can pull a bit on the leash. He will heel on and off leash, but you have to stay on him verbally. Comes to the clap of a hand if he is not terribly distracted. Off-leash, he will always be 100 yards ahead checking things out, he doesn’t run off but does have a little distance off-leash. I walk him in greenbelt areas, so he can run. He tends not to poop in the yard and will wait for his morning and afternoon walk for that. • No past abuse or fears, etc. • Romeo is an outgoing, friendly dog who needs his exercise and likes attention at home. He has the run of the couch and will sleep on a bed if you let him, or not if you don’t. The only problems I have is that he tends to bark in the backyard, and if he is off-leash and runs into someone who doesn’t like dogs he can bark at them and get you in trouble that way. Because he is a territorial guard dog, he can be an issue when in a campsite, for example, as he will bark at people walking by, or if he is tied to my truck same thing. Once off-leash, he is very social and wants to meet everyone. • Romeo is a “hair” dog, so he doesn’t shed. I cut his coat at least once a year, but if you go the whole winter without a trim in the Fall, he will have a thick, matted coat by Spring which can be a problem. Keeps him warm though. • Spike doesn’t get excited about other animals like Romeo does. • Spike is much more reserved than Romeo, he is quiet and can be shy or slightly anxious. 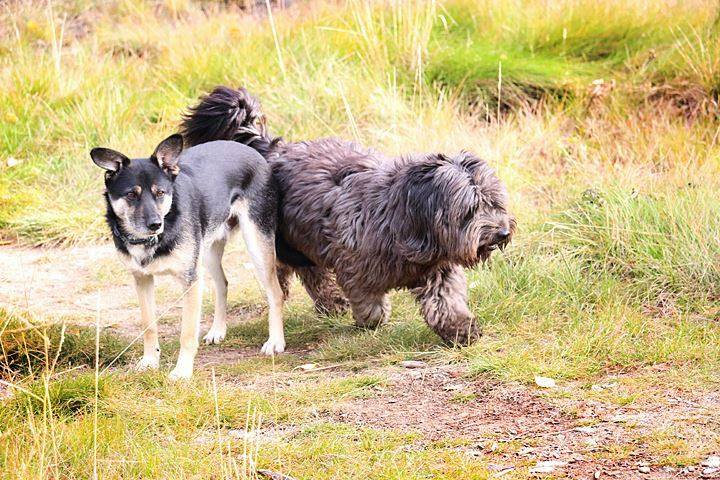 • Spike is very compliant, he only tends to stray further off-leash because he follows Romeo, otherwise he sticks around. Spike will poop in the yard as well as on a walk. • Spike is a “fur” dog, so he sheds as well but his coat keeps its short length. • Spike was an abandoned puppy in Ross River. He was found shivering at 40 below and rescued. Some say that is maybe why he can appear a little anxious. He is in his element with other dogs, walking and playing though. • Spike is very compliant and also has the run of the couch and bed if you let him. Good for a kid to snuggle with. I have had each of these dogs since they were puppies. They haven’t ever been separated so I’d like to find a home for them together. The reason for two dogs was so that they’d have each other’s company for quiet times during the work day. They are both great family dogs, but not really lap dogs. For me, I am not moving, but can’t spare the time for dog care anymore as other parts of my life are suffering for it. It is a difficult decision to let the family pets go, but a necessary one. My philosophy on re-homing the dogs is that I would like to have a few infrequent visits, either at their new home or in a park so that they can get used to the idea of a new home and not spend their lives wondering when I will return one day. I would stay available for dog-sitting if required. I think a potential new owner could meet them at my place, come for a walk or two and try dog-sitting them for a bit to see how things go. I’d like to find them a new place, but do not feel it has to be rushed into, cold-turkey, in one day. I would like them to have a place where they will have frequent walks or exercise. If you are a busy family with three kids and madly keeping up with all of that, I think the dogs will be neglected to their detriment. I’d like to find a home that feels they will be able to give them a half-decent life with exercise.